Middleburg, Va., With a simple snip of her scissors, Sheila C. Johnson cut through the equestrian-inspired ribbon before her and consigned a decade of planning into memory on Aug. 29. Salamander Resort & Spa was open, and one of the most anticipated hospitality projects of recent memory had become reality. The only new luxury destination resort in the United States to open in 2013, Salamander Resort & Spa features a previously unattainable collection of equestrian, spa, culinary, winery, nature and historic experiences for its visitors. Located in the historic village of Middleburg on 340 picturesque acres in the heart of Virginia’s famed horse and wine country, the resort is only 35 minutes from Washington Dulles International Airport and only an hour’s drive from downtown Washington, D.C. 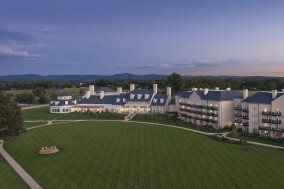 Designed to blend into the surrounding rolling countryside and respect the traditions of Johnson’s own nearby Virginia farm, which served as the architectural inspiration, Salamander Resort & Spa features 168 luxurious, spacious rooms and suites that far exceed the typical size for a luxury resort. With a full-service equestrian center and an array of programming that includes riding instruction and clinics from the area’s world-class riders, Salamander Resort & Spa embraces the region’s geographic culture, including jumping and polo. Just a short trot from the property’s 22-stall stable, ThorTurf riding ring and nine paddocks are miles of trails on which riders can easily spend a full day. Equine enthusiast guests even have the opportunity to board their own horses. Drawing on the inspirational venue with treatments that incorporate the surrounding area’s rich bounty, the Salamander Spa features 14 spacious treatment rooms with private stone treatment terraces and fireplaces, while the locker rooms include extraordinary vitality whirlpools, aromatic steam rooms, stone Tepidarium chairs and experiential showers. Capping the spa’s incredible spatial offerings is a tranquil outdoor courtyard, featuring an infinity pool, private cabanas, whirlpool, fire pit and dining café. Salamander Resort & Spa’s culinary program is overseen by a collection of stellar chefs: Culinary Director Todd Gray, Executive Chef Sean McKee, Chef de Cuisine Chris Edwards and Pastry Chef Jason Reaves. At Harrimans Grill, which features a soaring 42-foot-high ceiling and enjoys a panoramic view of the Bull Run Mountain Range, the cuisine celebrates Virginia’s Piedmont region, including a robust selection of steaks, chops, fruits and vegetables. The Gold Cup Wine Bar, designed like a winery tasting room with brick floor and wood-beamed ceiling, features flites of wine from around the world and a creative menu that offers small plates inspired by the Italian Piedmont. Just a few short steps away from the kitchen is a two-acre culinary garden, while the resort also features a state-of-the-art Cooking Studio with a retractable wall affording a view into the resort’s working kitchen and three video cameras. Salamander Resort is positioned at the center of Northern Virginia’s emerging wine country, commonly known as D.C.’s Wine Country. There are over 50 wineries located within a 60-minute drive and the closest is only two minutes away from the resort’s front doors. Area winemakers will regularly offer tastings at the resort, while private vineyards tours can be arranged for guests, who can enjoy country picnic baskets filled with fresh, farm-to-table cuisine from the resort’s kitchen. There is no shortage of other activities to relish at Salamander Resort & Spa, including nature tours of the area, falconry, an outdoor pool area for families, tennis courts, and a Jack Nicklaus Signature golf experience at nearby Creighton Farms Estates. One of the driving forces behind Johnson’s decision to build Salamander Resort & Spa was the relative absence of a luxurious and private meeting retreat in the greater Washington, D.C., region. Therefore, the resort features an array of facilities designed with corporate and association meetings in mind, as well as social functions and destination weddings. This includes the 5,000-square-foot Middleburg Grand Ballroom, the exquisite Hamilton Boardroom, and a variety of stone courtyards with stunning views. Rates during peak season at Salamander Resort & Spa range from $425 to $575 per night for a deluxe guest room, depending on views and availability. Non-peak season rates begin at $275 per night. Suite pricing ranges from $775 to $3,500 per night. Special packages, group rates and creative teambuilding options are also available. Salamander Resort & Spa is a member of the prestigious Preferred Hotels & Resorts collection. The resort’s design architect is WATG from Irvine, CA, while the architect of record is Architecture Inc., of Reston, VA. Project Management was provided by MGAC of Washington, D.C., while the general contractor was Turner Construction Company of Washington, D.C. Interior design inspiration was supplied by Thomas Pheasant, and interior design completion was provided by Kent Interior Design of Atlanta. For more information about the resort, visit www.SalamanderResort.com or call 866-938-7370. Salamander Hotels & Resorts is a privately owned and operated company based in Middleburg, VA, just outside Washington, D.C. Founded by entrepreneur Sheila C. Johnson in 2005, the company has a portfolio that features a collection of three stellar golf resorts including the Innisbrook Resort near Tampa, Reunion Resort in Orlando andHammock Beach Resort in Palm Coast; and the luxurious Salamander Resort & Spa in Middleburg, a 340-acre equestrian-inspired property near Washington, D.C. For additional information, call (540) 687-3710 or visit www.salamanderhotels.com.